All Girl Scout patch and badge programs have a 6 scout minimum; so, classes will not be set up until 6 paid reservations are received. Any Girl Scout patch or badge activity outlined below is available at either 10:00 AM or 2:00 PM on any day Laurel Caverns is open. 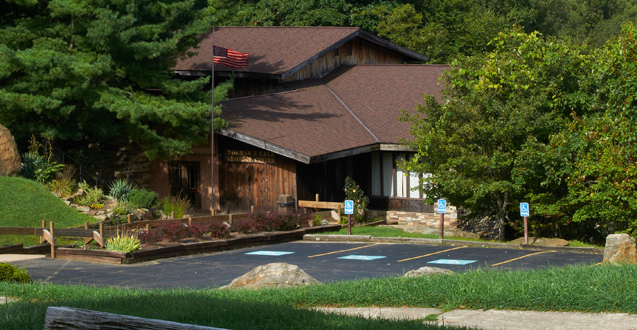 Please send your prepayment, along with your troop number, contact information, date and time(s) requested, and the activities requested to: Reservations – Laurel Caverns – Post Office Box 62 – Hopwood, PA 15445. Plan well ahead. You do not have a reservation until we have full payment in advance and you have a written confirmation. Phone: 724-438-3003 if you have any questions. Ask about traditional GSA patch and badge programs that might still be available. Our three most popular activities for Girl Scouts 12 years of age and up are our Laurel Caverns Speleology program, caving (spelunking) and cave rappelling. for those who wish to self-outfit for Lower Caving. Proper caving shoes are not reusable to an outfitter. Coveralls would have to be laundered after each use and the sand in them makes that very expensive. Lights could be rented but when that was tried they usually disappeared, so now they can only be sold. Thus, if Laurel Caverns outfits you for lower caving, the cost is $85 per person. If you outfit yourself, the cost is as posted here. Remember that two sources of light are required. A headlamp and a handheld light are best. Cellphone light, keychain lights, and other such dim sources are not accptable. Real cavers prefer coveralls. But, a long-sleeved shirt and long pants are acceptable. Wearing shorts and short-sleeved shirts can lead to abrasions. The surface of cave rocks can be like sand paper. For everyone under 18 years the Laurel caverns release form must be signed by a parent or legal guardian. Scout leaders, summer camp staffers, older brothers, relatives a minor might be visiting, etc. are not legal guardians. This form can be found at this website. Caving trips start at 10:00 am and 2:00 pm. Laurel Caverns is surrounded by about a hundred square miles of forest lands crisscrossed with old township rights of ways that are now hiking trails, gas lines, or just plain trees. GPS thinks they are public roads and this can get people lost. Allow lots of time to get to Laurel Caverns if you do not know where it is. Our staff has taken the stance that late arrivers miss much of the orientation and therefore are a safety risk to themselves and others. They have requested that no late arrivers be admitted. Further, late arrivers hold up the group and this is not fair to those who made a proper effort to get here on time. Please forgive us for the strict enforcement of these policies. We are regulated by the Bureau of Deep Mine Safety even though we are a natural cave. We are, by law, required to follow their protocols, especially with respect to rescues. Twisted ankles have to be treated as broken until X-rayed. Caving is a high adventure activity and can be dangerous. The terrain is rough and uneven. It is not a stroll through a shopping mall. Please don’t prepare for our lower caving trip as if it is. The upper caving activity is safer because that area does not have the cliff structures found deeper down inside the mountain. This three hour high adventure learning program integrates caving with the study of the flora, fauna (particularly bats), and geology of Laurel Caverns. Students will visit dig sites where heretofore unknown cave passages are being found and will be told the secret to the discovery of such passages. The opportunity to collect pottery clay is also a part of this program. At completion each participant is given an embroidered Laurel Caverns Speleology patch. This program requires participants to bring at least two good sources of light. Also, each must wear long pants, a long sleeved shirt, and shoes with good tread and ankle support. Laurel Caverns will supply the hard hats. Each participant must also fill out and sign an Upper Caving Release Form. The cave temperature is 52 degrees. Bring a change of clothing; this is a real caving trip and participants will get the wet sands of the cave on their clothing. Leaders and parents will only be charged the $20 upper caving group rate. This program is for Junior Girl Scouts who have reached their ninth birthday. It requires participants to bring at least two good sources of light. Also, each must wear long pants, a long sleeved shirt, and shoes with good tread and ankle support. Laurel Caverns will supply the hard hats. Each participant must also fill out and sign an Upper Caving Release Form. The cave temperature is 52 degrees. Bring a change of clothing; this is a real caving trip and participants will get the wet sands of the cave on their clothing. This program also requires a signed release form which, for anyone under 18 years of age, must also be signed by a parent or legal guardian. This Upper Caving Release Form must be read carefully for it conveys a sense of the risks associated with high adventure caving and tells participants how to properly prepare for their trip. Any individual under the age of 18 arriving without a parentally signed release form or not properly prepared will not be admitted to this activity. Trip sponsors and leaders may not sign for anyone as a proxy for the parent. This activity begins at the cave entrance in the Visitors’ Center and goes no further than those passages within a half-mile radius of that entrance. Participants must be at least 9 years of age. This activity allows you to see some of the largest rooms in Laurel Caverns as well as some of the crawl passages off the lighted area. One of the highlights of this trip is the opportunity for the scouts to “mine” their own take-home pottery clay. It is suggested that any Junior Scouts or siblings under nine years of age take the Traditional Tour and strongly suggested that the physically challenged carefully consider the strenuous nature of a caving trip. On this exploring adventure there is much climbing up and over rocks. Injuries can occur from this kind of climbing and participants must respect the points made by the caving release form. This family oriented program combines our one hour family tour of Laurel Caverns with Kavernputt, a miniature golf game through the largest simulated cave in the world. Siblings are invited as participants. At the conclusion of activities scouts receive a bat patch as a memento of their adventure. Cost: participants: $14.00 each, parents pay the same $ 14 rate as the brownies. Many groups add panning for gemstones or panning for fossils to this activity for an additional $6.00 per participant. Note: Prepayment is not required for any program involving Brownies but we do need notice of your plans so that we may be properly staffed.